Unlike most contemporary big bands, this is no random agglomeration of freelancers – the JOHN HOLLENBECK LARGE ENSEMBLE is an actual band consisting of top New York musicians. John had been writing for big band since he was in college at the Eastman School of Music and eventually formed the John Hollenbeck Large Ensemble in 1998 as an outlet to write the kind of music that wasn’t being written for this style of big band: “I saw some things that could be done that weren’t being done, and I thought there might be some other possibilities with a group that still has traditional instrumentation but the music itself is not traditional.” He gathered together a core group of musician friends who he had studied with at Eastman, and then selected a group of New York City musician friends and colleagues to complete the ensemble, creating a fine balance of camaraderie, integrity and talent – the perfect outlet for the creative expression of his music. Sunnyside Records celebrated the release of Songs I Like A Lot in 2013, John Hollenbeck’s fourth large ensemble album, featuring vocalists Kate McGarry and Theo Bleckmann, and pianist Gary Versace. 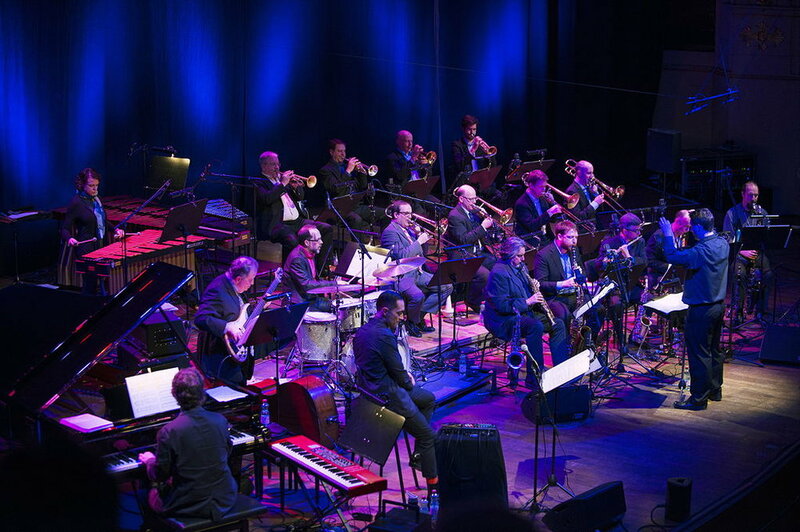 The Album, commissioned by the Frankfurt Radio Big Band, who also recorded it, is an exhibition of imaginatively remolded songs from a diverse array of musical worlds. According to DownBeat’s Frank Alkyer: “With Songs I Like A Lot, John Hollenbeck has created an absolute masterpiece of arranging” and showcases John’s arrangements of songs by Jimmy Webb, Imogen Heap, Ornette Coleman, Freddie Mercury and others. Hollenbeck’s arrangement of Jimmy Webb’s “The Moon’s a Harsh Mistress” from this album is nominated for a 2014 GRAMMY for Best Instrumental Arrangement Accompanying Vocalist(s). The John Hollenbeck Large Ensemble’s second CD eternal interlude and their debut CD A Blessing also earned GRAMMY nominations for Best Jazz Large Ensemble Album. As The New York Times’ Nate Chinen said of the group’s second CD: “The drummer and composer John Hollenbeck inhabits a world of gleaming modernity, and “Eternal Interlude” (Sunnyside), the second album featuring his Large Ensemble, reflects both the clarity and brightness of his vision.” Hollenbeck’s compositions have also been recorded by Austria’s Jazz BigBand Graz on his third large ensemble album, 2006’s critically acclaimed Joys and Desires.